Where to even begin... We bought a house right on Fourth Street about four months ago. At first we were getting to know the house, and the sounds it usually made. I was trying to frighten my stepsister by telling her what I had heard and by over exaggerating them. She got all freaked out, and we went through the basement taking pictures. When we walked out of one room and opened the door to another to take a picture, the other door opened a good inch or two. I saw it, and I asked ''did you shut that?'' And she swore she didn't. It took a bit to close that one (the door was slightly too large for the frame,) so we went back to our shared bedroom, and she was searching through the photos. She found one that was taken about 45 seconds before the door had opened, and it had a face in the upper right hand corner. It was a bit small in proportion, but we tried to recreate it and couldn't. (Very very small in the very very top right. ) It's absolutely not photo shopped. I checked her phone for a Photoshop app because I thought she was messing with me. Now everyone's had their little stories here. My step mother heard the front door open, and a woman call ''hello!'' So she jumped up (being the only one home. ) She replied ''yeah. Can I help you?'' But the door was locked and shut. My dad came down to the basement almost nightly during the 5-7 o' clock hours into this small room that used to be the laundry room. He would shut the door and stay in there for about five minutes then came out and not shut the door or turn off the light. One time we asked him what he was doing and he said ''none of your business. '' Now things got WEIRDER. We've had messages written on the mirrors in the steam from the shower asking us to help with revenge and things (it did not threaten us. ) A few nights ago I was home alone and went downstairs to grab pajamas. I took a shower upstairs. Then when I came back down, every door and light was open and on. I didn't think too much about it and sat on my bed to light a candle. Then I began hearing noises from the next room. It was as if someone was looking for something. That room has nothing in it to be searched. I sat there, still as a rock for about ten minutes before trying to call my dad, and the first sound my phone made, the noises stopped. Now the other day I walked down to my bedroom, and my bedding was pulled back at the foot of my bed like someone had lay down under it. I mentioned it to my stepmom and stepsister. They both came down to look and agreed it was weird. While we were down there we asked my stepmom what my dad did in the old laundry room every morning. She was super confused and walked into the room, and we looked everywhere we couldn't find what he could be doing. Everything was empty in that room, so we went upstairs and asked him. He said he didn't remember doing it ever. Then at four o clock one morning they came downstairs trying to scare us. I heard them come down giggling and laughing. As they did and walk into the next room and tried to scare us by banging on the walls. We didn't give them a response. They came out, talked to each other about how it was a failed attempt and wandered back upstairs. I thought one of them had stayed because I saw a shadow from the corner of my eye. I fell back asleep soon though. Only to be awaken an hour later to my dad SCREAMING in the middle of the basement. Now a little about him, he is a prankster, but he also has a big ego and will not admit to being scared unless it's big. They explained how he had gone into the room he supposedly went into every morning to try and frighten us. My step mom was in another room and was going to knock on the walls to wake us up. My dad had entered the room, and in the little bit of sunlight through the basement window he had been able to see his shadow, and then another showed up. Not a big deal. Then the other shadow doubled over, like it was hiding and ran off. He turned on the light (which hadn't been working the first time they came down,) and I flickered on. They went upstairs, my stepsister and I not believing them. Then I mean not even a minute later we heard in the next room what sounded like someone looking for a light switch. I called my dad and heard him and my stepmom talking upstairs. They told us to come up and sleep on the couch. After the initial shock he went back down and asked ''what do you want?'' He said he saw a shadow under a doorway. He ran back upstairs. He went to bed alone then and not long after we hear him land on the floor and run into the doorway. He ran across the house dry heaving. Finally he said he felt someone lay next to him and could hear them breathing. He's the only one that hadn't heard the story about my bedding. We convinced him to sleep downstairs with everyone, because running away only gave energy the satisfaction. And In the next hour we were all lying down there, and we all saw the shadow at least once each. Sometimes we would all see it. Hi read your story, creepy. But with the picture I can't see the face in the top right corner however first thing I saw looking at it is right in the middle of the picture to the left of the top of the water tank there is a face. Kind of looks skeletal. It's kind of freaky. I moved into a house on 4th Street in CDA. Do you live in this same house still if not judging by the picture I'm in the house your talking about. Is it in the parking lot of kc auto paint? Right on 4th? If so please contact me I'd like more info. pitsmokemaster @gmail .com. 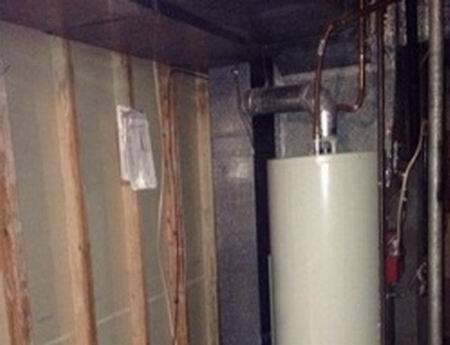 Yeah, just like Justin said there's a faded face right above the water heater.